Sotheby’s recent sale of manuscripts by composers such as Birtwistle, Ades and Colin Matthews has raised money for the Heslington Foundation. 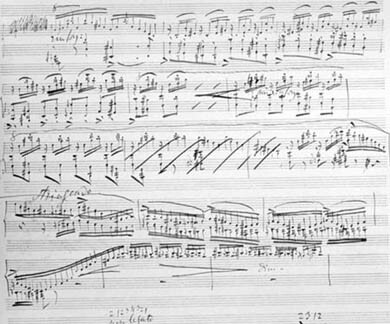 It also raises awareness of the likely rarity of handwritten music among contemporary composers in a digital age. Absolutely. Seeing the manuscript reinforces the seriousness of the composer’s intention; yes, he really meant the stringendo, this accent, that crescendo. Written instructions seem more emphatic than neatly printed ones. The volume and urgency of a crescendo can almost be gauged by the way the sign is drawn. This entry was posted in Composers, Music and tagged Colin Matthews, Liszt manuscript, Liszt sonata, Sotheby's music manuscripts, writing music by hand. Bookmark the permalink.